Will Sony's PlayStation 3 Price Cut Save It? The PlayStation 3 just got a little cheaper, but is it cheap enough to put Sony back in pole position after years lagging behind Nintendo and Microsoft in unit sales? Early reports suggest that yes, the $50 shaved off the entry-level 160GB model (from $300 to $250) and 320GB premium model (from $350 to $300) are impacting. In the U.K., at least one retail source claims PS3 sales have surged 65 percent, and both Target and GameStop are saying PS3 sales are well up in the U.S. following the Gamescom-timed price drop. It'll help that this week we have Deus Ex: Human Revolution on tap, a V.I.P. cyberpunk first-person shooter amassing enthusiastic recommendations (so far, anyway). Sure, it's multi-platform (word is the best version's on PC, visually speaking), but for first-time console buyers or anyone without the PC horsepower to crunch it, you can put the full experience together for (just?) $310 and change. 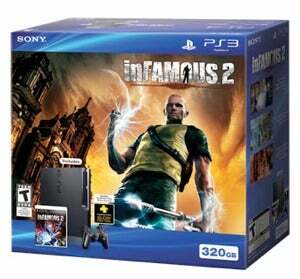 It'll also help that Sony's selling a "limited" bundle version of the 320GB PS3 with inFAMOUS 2 and tossing in 30-days of PlayStation Plus access for $300. That's a $60 game plus a $50 cheaper console, or at least $110 in savings if you heart Sucker Punch's electricity-slinger Cole McGrath. I'm betting Sony keeps this "limited" version around at least through the holiday months. But won't Microsoft follow suit? Don't bet on it. The horse out front usually doesn't. Nintendo waited years to fiddle with the Wii's price. Microsoft's outpaced both Sony and Nintendo for months and keeps saying a price cut's wishful thinking. Besides, even at $250, it's not like the PS3's in impulse buy territory. Unless Xbox 360 sales suddenly go south, which they won't, I wouldn't count on a penny of price relief from Redmond until 2012. That, and Microsoft already has a $200 version of the Xbox 360 (the puny 4GB model), even if it can't hold a candle value-wise to its pricier siblings. Credit where credit's due. The PS3's moved substantially from its original precipitous (and in hindsight, pea-brained) November 2006 launch pricing. $600 for 60GB? $500 for 20GB? You'd think Sony hired Trip Hawkins to helm the launch. And the company's been slow to react, no doubt to mitigate component cost hemorrhaging. They screwed up and spent a lot of time annoying us with claims the price was worth it, but in actuality, their hands were tied. Microsoft's going to tell you it's all about Xbox LIVE (and more recently, Kinect) but in truth, it's about the economic bottom line. Sony's in last place because they launched a year late, then couldn't bring the PS3's sale price down fast enough. That they're only two or three million units behind Microsoft in worldwide console sales says more about Microsoft's inability to capitalize on the PS3's preliminary shortcomings than preference for one system over another. From the start, this has been Microsoft's game to lose. Who do you think's the better deal? Do you believe paying to access third-party services like Netflix and Hulu is fair? Are you more concerned about features like crossover voice chat? Is Gears of War 3 a must-have? What about Uncharted 3? Update: "Save" doesn't mean the PS3's in danger of vanishing from the face of the planet. But it's surely bled Sony cash-wise, with all the company lost year after year battling component costs (to say nothing of this spring's PlayStation Network hacking debacle). Consequently, however you care to spin it, the PS3's no PS2. Given the towering sales success of Sony's prior console (as well, the fact that gaming came into its own, culturally speaking, well after its decline), that the PS3's barely a third of the way along in unit sales five years post-launch, and consistently underselling the Xbox 360 both in monthly units moved and game attach rates, means that yes, it could do with a little saving. I doubt even Sony, behind closed doors, would dispute that.